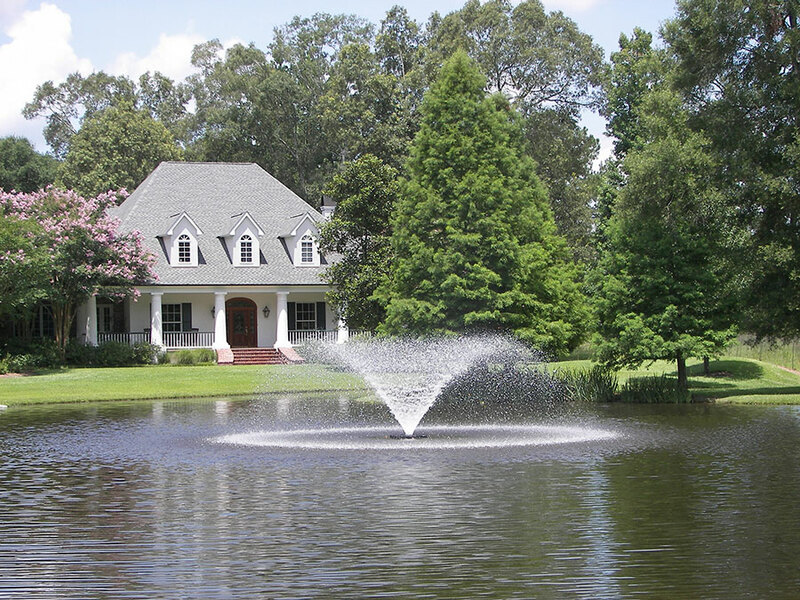 There are a wide variety of Kasco fountains for ponds and lakes. In this fountain review we will break down the details of each model, compare them and explain the benefits of each model which will help you determine which fountain model and line will best fit your application needs. Kasco offers three different lines, series or styles of fountains; first being the Aerating Fountain, then the Decorative Fountain, along with the XStream Fountain. Each of these have certain benefits and reasons why you would choose them over others. The Kasco Marine VFX aerating fountains offer a good amount of aeration along with the display. 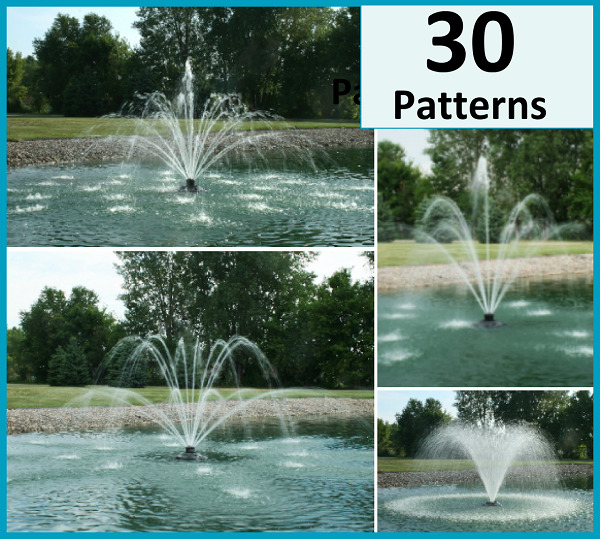 They are the ideal fountain for getting aeration benefits for the biology of the pond as well as having the nice classic V-shape display. The VFX series are available in half horsepower up to 5 horsepower in size. They are UL/CSA approved as are all Kasco fountains. These are going to be the perfect fountain where aeration and display are equally required or needed. 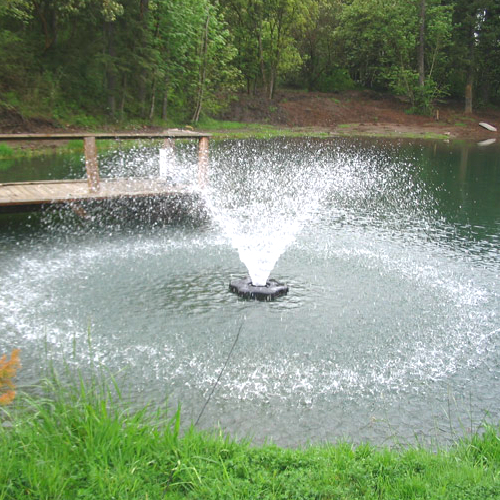 Minimum depth is a big selling point for Kasco fountains as they are able to placed into some very shallow lake and pond areas compared to the competitors. Residential homeowner use is very popular along with commercial use with golf courses and also some more niche markets like evaporation and industrial aeration, specifically with the evaporation, areas where the user will want to get rid of water rather than treating or discharging polluted water. The VFX series fountains are available in single or three-phase options. In the single-phase, Kasco has the 120V or 240V option. As with all Kasco fountains, the control panel is included with it, along with floats, with screens and mooring ropes which is everything you need to get set up. There are the different sizes available for the power cords from 50 feet up to 500 feet on the 120 V versions. The only option would be fountain lighting and that’s optional with all of our fountains. Warranty is based on size, one horsepower and smaller is going to carry a 2-year old warranty and a 3-year warranty on the 2 horsepower fountains and larger. The sizing and the fit for the VFX series a lot of times it is based on pattern, height or width that our customers are looking for, but it’s also based on the aeration benefits and for aeration purposes. We recommend about one and a half to 2 horsepower per acre. For industrial application where you might be looking for evaporation or have water treatment needs, typically it’s going to be a larger sizing, about one and a half to 2 horsepower per acre. The next line of fountains is the J-Series decorative fountains and as the name implies, these fountains are more decorative and you get more displays with it, a better variety of shapes and sizes. The biggest option with the J-Series is the full selection of nozzles that are included. The J-Series are available in three-quarter up to 7 and a half horsepower sizes and then at 2 horsepower and larger you do have the premium nozzles as an option above and beyond the standard set of nozzles. As with the VFX, the J-Series fountains are UL/CSA approved and typical uses are going to be anywhere that you want to have a nice display, particularly where you want to draw attention to a certain area, such as golf courses, clubhouses, restaurants, entrance areas, subdivisions and a variety of commercial applications. The J-Series decorative fountains are available in single or three phase options and a control panel is included that is sized and designed for that specific unit, Power cords are from 50 feet up to 500 feet with the 120 volts capping out at 200 feet. Floats are included as well with the mooring ropes and the screens. With the J-Series fountains there are options for lighting and also with the larger horsepower there are premium nozzle options. For warranty options, the 1 horsepower and smaller is going to offer a 2-year warranty, and the 2 horsepower and larger come with a 3-year warranty. For sizing of the J-Series, it’s based on a specific pattern of shape or a specific pattern size that the customer wants to have. For example, if they want a 20 feet tall fountain or they want a 2-tier pattern. If they don’t necessarily have something in mind for that, then we recommend for aeration, 2-3 horsepower per acre, but you can always go larger than that. Most people interested in the J-Series Fountains base it on a height, width or a certain shape that they want to meet. The final series would be the XStream and this is a one-unit series as it is a little bit different than the other fountains. The Xstream has a high RPM motor, compared to everything else for fountains that is a low RPM. The advantage of a high RPM fountain is that you build up more pressure and you can get bigger displays out of a smaller horsepower, but this advantage is going to be a little bit less aeration efficiency. The unique thing about the XStream fountain is that with the one nozzle included, you can get over 30 different patterns out of that one nozzle. The nozzle has a bunch of holes made into it and you can plug different configurations to create the different displays you want.. You can also take the nozzle off along with the flow straightener and get a V-shape display. The XStream is available at a half horsepower and 120 volts, but the tallest pattern is 8 and a half feet tall. For this XStream fountain, we recommend up to about a third of an acre for aeration as you are not going to want to put this in a 5-acre pond, it’s just going to look too small. They are UL/CSA approved and include the control panel, along with the float, the mooring ropes, screens and the power cord. The power cord goes up to 200 feet because it is 120 Volts unit. The warranty for the XStream fountain is 2 years. Typical uses for the XStream are going to be the small backyard ponds and small entrance ponds. The XStream fountain is a very versatile and good performing unit.